Centenary provost and dean Dr. Jenifer K. Ward, Centenary president Dr. Christopher L. Holoman, LSU Law dean Tom Galligan and LSU senior vice provost Jane Cassidy pose for a photo after signing a memorandum of understanding between the two colleges. BATON ROUGE, LA — Centenary College signed a memorandum of understanding with the LSU Paul M. Hebert Law Center to create a partnership that will provide Centenary students who meet LSU Law admission requirements and who are interested in public interest careers an opportunity for an expedited admissions review and notification process. Representatives from LSU Law and Centenary signed the agreement at a ceremony held in the LSU Law Robinson Courtroom on January 23. This signing establishes an exclusive relationship between LSU Law – the flagship state institution law school – and Centenary – the only Tier One National Liberal Arts college in Louisiana. “As the oldest private college in Louisiana, we are pleased to enter into this partnership with the flagship of the LSU system. 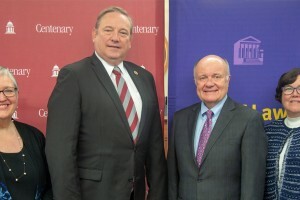 This will allow both institutions to better serve all our state’s residents by offering a variety of paths to and through law school, preparing them to serve the people of Louisiana,” Centenary president Dr. Christopher L. Holoman said. With the agreement, graduating students from Centenary who complete an undergraduate minor in Legal Studies, have an interest in public interest work, submit their application by Dec. 1, and complete the LSU Law admissions requirements will receive priority consideration, automatic financial aid consideration, an early admissions decision for the following year’s matriculating class, and will be presumptively admitted assuming they meet LSU Law’s other admissions requirements. This arrangement offers a pathway to admission with expedited consideration and early decision, but it does not guarantee admission to all candidates who meet the basic requirements. The LSU Law Center’s Admissions Committee still reviews each candidate and reserves the right to approve or deny admission. Centenary’s Legal Studies minor is an interdisciplinary course of study that exposes students to a range of courses that strengthen their critical thinking and communication skills, hone their ability to interpret and apply case law, and understand the role and effect of law within various societal contexts. “Today’s agreement enables promising Louisiana high school students to start their academic career at a small, nationally ranked liberal arts college before they join a large and prestigious law program at a major public university. LSU’s respected public interest law clinics, externships, and competitions provide a natural fit with Centenary’s emphasis on practical and thoughtful learning and a dedication to serving others, in this case for the good of the state of Louisiana,” said Dr. Jenifer K. Ward, provost and Dean of the College at Centenary. Seven Centenary graduates currently are enrolled at the LSU Law Center, and more than 70 Centenary alumni have graduated from LSU Law since 1970. Students educated in Centenary’s challenging Legal Studies program are attractive candidates for LSU Law because the program allows them to examine the role and development of law from different perspectives within a liberal arts curriculum. Prospective students interested in more information about LSU Law’s admission requirements can visit law.lsu.edu/admissions, call 225.578.8646, or email lawadmissions@lsu.edu. For more information about Centenary’s Legal Studies program, contact Dr. Mark Leeper at mleeper@centenary.edu or 318.869.5180.